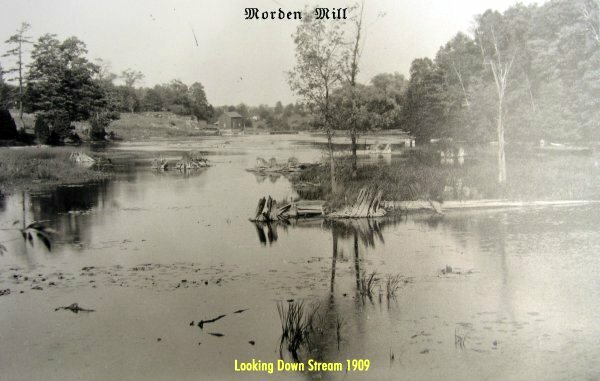 The Morden Mill & Barn are located in the quiet country side on Crooks Hollow Road in Greensville, Ontario. Not too far up the road from the old Morden Mill & Barn, is the Darnley Mill. The area around both mills is a breath taking experience of beauty in the summer time, complete with a sparkling running creek with a wilderness effect that surrounds this area in the day time. At night it can change into a spooky experience with the feeling of being watched and noises that can capture the imagination of times long gone by. When one stands near the old mills one can see movement of shadows moving in front and behind, while some seem to fly overhead. Also to add to the excitement one can feel a presence of someone or something standing right next to you. Often voices can be heard as if someone was using a low type of whisper, or children playing in the area very late at night. The noises and sounds I speak of are those that cannot be explained away as easily as some folks may think. Many folks have experienced all the above. "Dedicated to the Morden Family"
Crooks Hollow Road holds a lot of history, from the Indians that used to occupy the area to the United Empire Loyalists and early settlers that came to this area and called it home. The Morden family was one of the Loyalists that came to this area to start up a mill. In fact they were the first family to start up a mill in the Spencer Creek area. Ann Morden and her family were the first settlers in the Dundas valley, also known as the western end of Flamborough Township. Ann Morden's story had a tragic twist of fate with her life before coming here to Canada. The fate of her husband (Ralph Morden) was linked to Robert Land, the first settler of Hamilton. The story has been passed down from generation to generation with some things added to the story now and then. 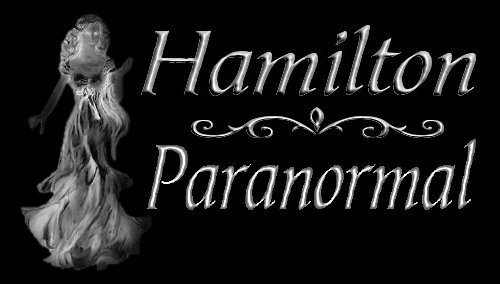 The story became legend over time in both Hamilton and the Dundas area. Ralph Morden, Anne's late husband was born in Yorkshire, England, in 1742. Ralph was the son of George Morden who immigrated to America with his family about 1743. In 1765 Ralph Morden married Anne Durham of New Jersey, and adopted her religion of the Quakers. This move to the Quaker religion caused him not to partake military service when the revolution broke out 11 years later. The Mordens were known as a quiet unobtrusive family keeping to themselves for the most part. Family records show that Ralph and Anne had four sons, five daughters, John, Ralph, James, Moses, Catharine, Jane, Eleanor, Anne and Elizabeth. Robert, son of Samual Land, was born in 1736 in New York State. He had served as a private in the New York Regiment during the war. Robert then took on the roll of despatch carrier in the British Army. He was captured in the year 1777. He was later released from custody for his name did not appear on the proscription of known traitors. Upon his release he resumed his position in the British Army as a Despatch Carrier once again. Robert land was recognized in Easton PA. in the year 1780 and his actions were closely watched. Land had completed his business in Easton PA. and hired "Ralph Morden" to help guide him past the sentries to an Indian ladder which had been placed against a cliff at an unlikely position. The Authorities learned of the plans that Robert Land had made, along with his friend Ralph Morden. So a plan was made to capture the two men. The officer in charge of the capture wrote a letter to his superior informing him of the capture. "May it please your Excellency"
"I Embrace this opportunity by the Rev. Mr. Treat to inform your Excellency that since my last (signed by Mr. Ordt the 13th Inst.) That Col. Bond of New Jeresy having received Intelligence that a party of Torries on the twelfth of this instant had appointed to meet near the water gap of Deleware in this Township. From thence to make off to the Indians headed by a certain Robert Land late of Coshecting , an old offender whom I had made return of about two years ago to council sometime in Easton Gaol but at the last supreme court of this county has been admitted to bail as judge did not find his name in the proclamation. Col. Bond having found out the very time of their march placed a few volunteers in the ambush who fired upon them and wounded two of the enemy upon which two of them made now as prisoners VIZ. Ralph Morden and a British prisoner who it seems had a leave to run at large. They had each of them near 30 LB. of flour on their backs, Land tis said was seen to fall when fired upon and dropt his knapsack, beaver hat and cane. Tis supposed he was mortally wounded as there was plenty of blood discovered next morning. A diligent search has been made but to no purpose. Tis thought he was either killed or conveyed away privily by the Tories as a number of them reside near this place where the action happened. Morden it seems made a confession but as the particulars have not come to hand cannot form you therewith. "To his Excellency Joseph Reed Esq. Pres. Saml. Rea. Lieut." Robert Land was only wounded after the ambush. He escaped to rejoin the British. But for Ralph Morden, he was captured and imprisoned in the jail at Easton PA. where he was charged for being a British spy. He was further charged with conspiring to bring the Indians down to massacre the inhabitants.It was charged that he "maliciously and traitorously with a great number of traitors and rebels being armed and arrayed in a hostile manner with force and arms did falsely and traitorously assemble and join himself against the commonwealth and did give and send Intelligence. Ralph Morden's trial began on Oct. 30th, 1780 in an Easton Courthouse. The residing Judges were Thomas Mckean, George Bryan, and William A. Atlee. The letter that was found weighed heavily against him in court. Yet when asked for the list of persons taking part (outside of Ralph Morden and Robert Land), a list was never given for one could not be found. Further evidence came to light of the letter found in one of the knapsacks, that both men had filled with 30lbs of flour. It was mentioned beyond doubt by the captors that the letter was in Ralph Morden's knapsack. Morden protested his innocence till the end, but his pleas fell on deaf ears. He was hung on Nov.25th/1780. Did an innocent man die (Ralph Morden) on Nov: 25th/1780? Robert Land was a known fighter in the British Army. He acted as a private and despatch carrier for the British army. Ralph Morden had no affiliation to the British Army. He was only helping out a friend with his knowledge of nature, to guide him by foot through the rebel guarded hills. The letter that was sent out by Joseph Reed mentions that both men had a knapsack on them at the time of the ambush that was set by Joseph. He further claimed that the letter that weighed heavy against Ralph Morden was indeed found in his knapsack. Joseph was the fellow that first captured Robert land back in 1777, only to be released. And again in 1780, but this time Robert Land got away with a bullet wound and was never captured. The letter could have been in Robert Land's knapsack and was said to be found in Ralph Morden's knapsack. There were seven witnesses for the prosecution and only one for the defense. The witnesses for the prosecution were that of the ambush set up by Joseph. When the defense asked for the list of persons taking part (outside of that being Ralph Morden and Robert Land), a list was never given for one could not be found. Anne Morden was grief stricken with the loss of her husband. This left her poor and friendless, to raise her family in a hostile neighborhood. She remained on the farm in Easton PA., but three of her sons slipped away to join the British army. John and James joined up with the King's Royal Regiment of New York, Moses joined up with the New Jersey Volunteers. John and Moses were discharged in 1784, and James got his discharge in Montreal in 1785 and he was a veteran at the age of 20. As fate would have it the three Morden boys made their way to Fort Niagara where they had a reunion during the summer of 1786. John returned home to try to persuade his mother to come to Fort Niagara and she agreed. John had helped the family move and that winter of 1786 the family was reunited once again. In the same year John had relocated Robert Land who had settled on the shores of the Burlington Bay. John had discovered that all the water front land was taken up by squatters, so he pushed on to Cootes Paradise where he first saw and fell in love with the Dundas Valley. That winter of 1786 was a busy one for the Morden boys. They gathered tools and supplies so that in the spring of 1787 the boys could look forward to clearing the land, build a few cabins, plant and harvest corn, wheat and potatoes. In the year of 1787 the Morden boys had cleared the land and built a few cabins. It was also the time that the Dundas Valley got it's first 11 settlers to the area. Those being Anne Morden, her sons; John, Ralph, Moses and James, her nephew David. Her daughters; Betsy, Nancy, and Eleanor; and her orphaned granddaughters; Mary and Jane Long. Anne learned the Mohawk language, and reputedly was a translator of the language for others in the Dundas community. In the spring of 1788 the whole Morden family watched their first wheat crop begin to grow among the stumps. They also planted corn and potatoes in the same year. As July rolled around the days got longer and hotter. There was no rain for days. The Mordens were getting a little anxious, but the heat started to take its toll on the crops for day after day the sun scorched the earth and all living things. The streams started to dry up and the crops withered up and died. The wild animals sought other places for food. The Mordens had to face the reality of the situation for they knew the way things were heading there would be no harvest or food for the upcoming winter. The Mordens like many other settlers to the area had to apply to the government for aid. 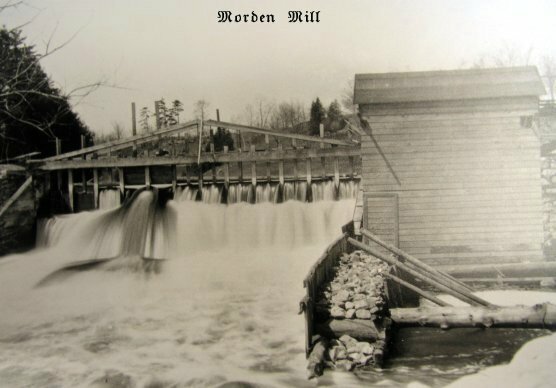 When the town of Flamborough did a survey for West Flamborough Region they found that the Mordens were squatting on sixteen hundred acres of land and the town named the creek Morden creek after the family. Because of the tragic sufferings of this family at the hands of the rebellious American colonists, they were permitted by the British authorities, to penetrate the wilderness to choose their own lands. Although Ann and her son John moved to London, Ontario in 1808, where Ann died in 1832 at the age of 89, her legacy as a strong and determined pioneer in West Flamborough are still remembered. 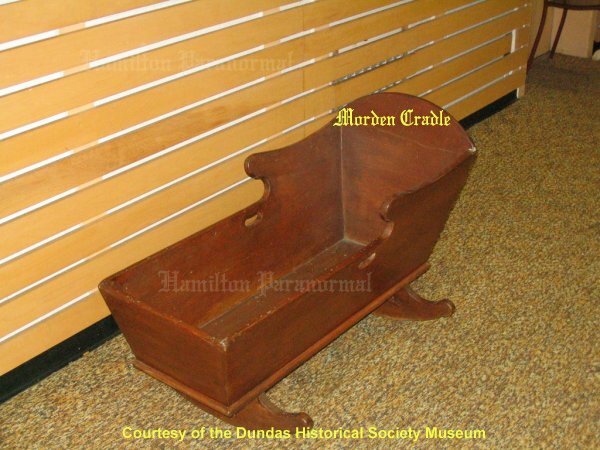 And the Morden cradle that was carried through hundreds of miles of bush to Upper Canada remains in the Dundas Historical Society Museum as a tribute to her bold will and tremendous courage. Many thanks to the Dundas Historical Society Museum for allowing us to photograph the Morden family cradle pictured above. To visit their site, please click on the picture. The first saw mill on Flamboro Stream, (which had been renamed to Morden Creek and today is now known as Spencer Creek) was erected about 1840. 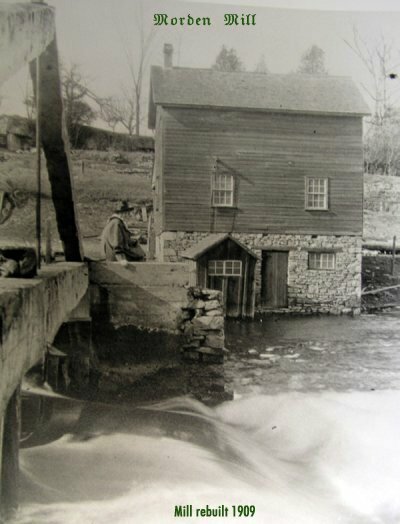 James �Big Jim' Morden, a son of George, added a flour mill with his son Jonathan in 1841, which passed down through the family until it was destroyed by fire in 1905. After the fire another mill was built in 1909 and stood where the old mill had burned down. 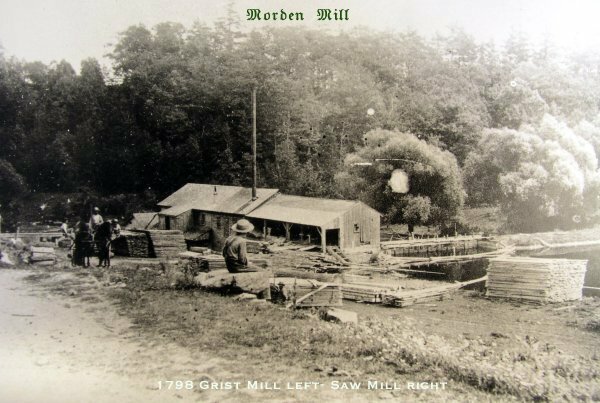 John Morden built a chopping mill on the site and also operated it until 1915. The family became involved in the community and became known as "a founding family of West Flamborough Township". They were involved in local politics, James Morden served as a Reeve and member of West Flamborough Township Council for 20 years. They were involved in every aspect of community life from business to church, and have resided in West Flamborough Township continuously since 1788.